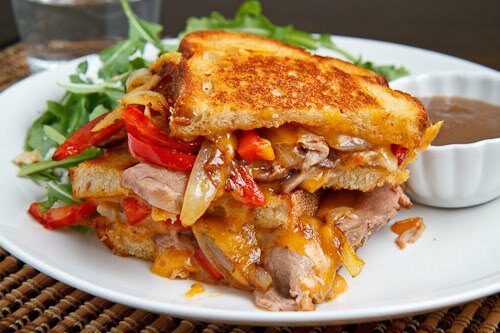 Moist and tender roast beef along with sauteed onions and peppers in grilled cheese form is a truly decadent way to enjoy your leftovers! A touch of horseradish gives this sandwich a bit of bite and if you have any gravy leftover feel free to use it for dipping! While I still had some of the leftover roast beef the other week, I made sure to make a few roast beef grilled cheese sandwiches! This has to be one of my favourite ways to enjoy roast beef leftovers and it gave me the perfect opportunity to update this recipe and to add a new photo (see above). Although simply throwing the roast beef into a sandwich with some cheese and grilling it would be great, I like to add sauteed onions and peppers to bring in some new flavours and textures. There are a lot of cheeses that go really well in this sandwich such as swiss, provolone, mozzarella and this time I went with a sharp cheddar. Of course a touch of horse radish is always welcome and if you have any gravy left over from the roast beef dinner, adding a bit inside the sandwich is good and then serving the rest for dipping is even better! Leftover roast beef is such a magical thing! Add the bell pepper and saute until tender, about 5 minutes. Assemble sandwich and grill until golden brown and the cheese has melted, about 2-4 minutes per side. You always seem to cook what I'm craving! Try this if you have any more roast beef – make a grilled cheese using the beef with pepper jack cheese. On sourdough. Makes me drool. Love your recipes, Kevin. Wish I had some of that sandwich here! I love how stuffed this sandwich looks. Grill the cheese and pile on the beef. Sounds like a good idea to me. I love how yummy your bread always looks! I love roast beef sandwiches! Now I'm hungry. Looks delicious. Roast beef is my favorite deli meat, but oddly I've never had it on a hot, grilled sandwich! Great idea, this looks like a delicious combination. Kevin, I know exactly what you should do with your life…….of course open a bistro with a killer "take-aways" on the side!!! Come on, what's stopping you!!!! What a mouth-wateringly good sandwich! I love seeing what you do with leftovers. You are always so inventive. Another fabulous recipe post! Just love it! I am not a big fan of beef but now I am craving your beef and cheese sandwich!! Look at all that oozing cheese. This sandwich looks delicious Kevin! This is definitely crave-worthy. Yum! Btw, I've been following your blog for almost three years! Keep it up, man! Sometimes I wish I could go directly to leftovers! This sandwich is making me salivate Kevin … it's definitely crave-worthy! oh my gosh, my mouth is just watering looking at the picture. amazing, fantastic way to use leftovers! Now that's what you call a sandwich! I shall make this over the weekend!!!! This looks incredible, I can't wait to give it a try. I still have your philly cheese steak sandwich on my list of things to try. I need to put my magazines away and start trying out some of these amazing recipes you are posting. WOW! Kevin yours sandwich are always amazing and so tasty!! Nice sandwich combination there! And yes, horseradish is a must for roast beef! oh my…I would never have thought of this but then again, it really is like a twist on the philly steak N cheese eh? Love Love Love sandwiches and that looks great! Wow! I just found your blog through google! I have a cooking blog as well, you should check it out! Equally good with leftover turkey just substitute a bit of cranberry sauce for the horseradish! Equally good with leftover turkey. Just substitute a bit of cranberry sauce for the horseradish sauce. Wow, this grilled cheese looks amazing. I love the idea of using the gravy for dipping. Messy, gooey, and delicious – my kind of sandwich!!! What’s going on with your blog? I find that I can’t comment, or ask a question…..and the last comments were made in 2011. Please let me know what difficulties you are finding on my site! I would love to make it easier to use! You can leave another comment here or send me an email: kevin@closetcooking.com Thanks!